1.The photoresistor module is sensitive to ambient light and is often used to detect the brightness of light in the surrounding environment, triggering a single chip, relay module, PLC, etc..
2.When the brightness of the environment light does not reach the set threshold, the DO-end output is high voltage. When the brightness of the external environment light exceeds the set threshold, the DO-end output is 0. 3.The DO output can be directly connected to the single chip. The single chip will check if it's 1 or 0, thereby detecting the change of the brightness of the ambient light. 4.The DO output can directly drive the relay module. They can be matched to form a optical switch to control devices. 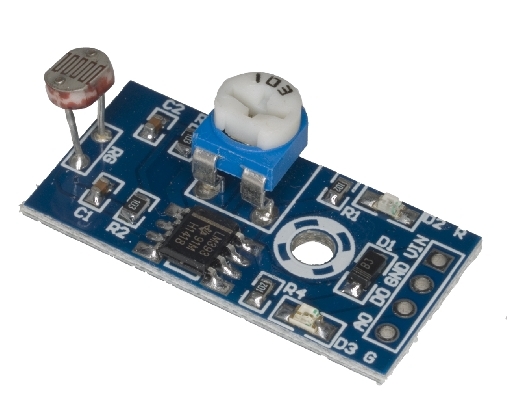 5.This module analog output AO can be connected to the AD module. Through AD conversion, more accurate values of environmental light intensity can be obtained.